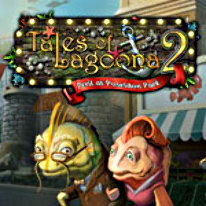 Return to the undersea world of Lagoona and save Poseidon Park from closing down! Welcome back to the undersea world of Lagoona! Poseidon Park is in trouble. Mayor Peabody has shut it down until repairs are made, and Leona is desperate to save her grandparent's park. Join a quirky cast of characters as you all work together to save Poseidon Park. Take quests from the townsfolk, solve over 160 puzzles, take care of the park's resident sea ponies, and even earn over 60 unlockable trophies! Poseidon Park is brimming with things to do. Collect items to sell at the local market and fully restore the park with over 150 upgrade options! Seek out hidden gems, earn bonus goals, and solve hundreds of brain-teasing riddles.